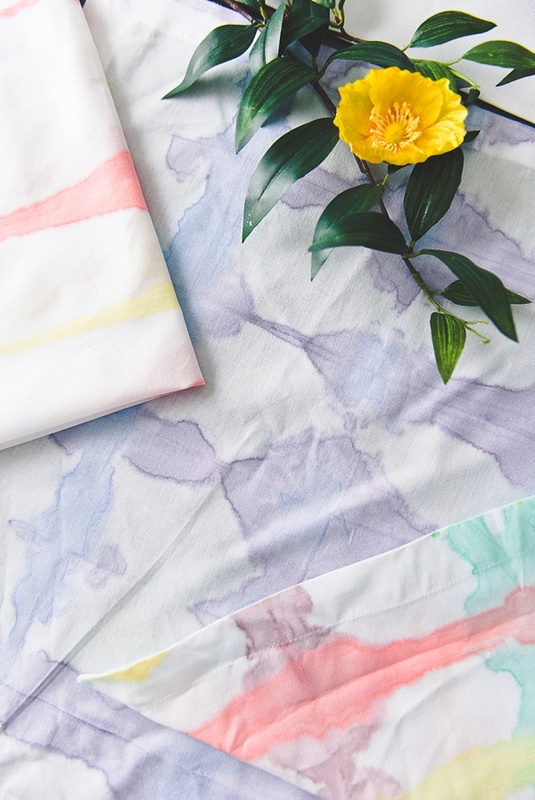 Inspired by eco-friendly lifestyles and pretty handmade details, we're diving into the modern world of tie dye and giving plain white cloth napkins a major upgrade for your big day! Whether you choose to have a completely DIY wedding or a wedding with handmade touches, this project is so easy that your little flower girl or ring bearer can do it! (And P.S., we totally recommend making this a fun group activity for the whole fam.) 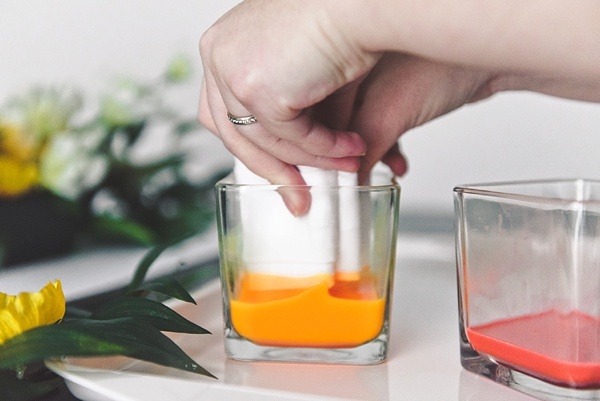 Using a non-toxic and water-based dye, this special dye doesn't need all of the other fussy ingredients that normal tie dye requires. Dip, dry, and iron! That's literally it, so let's get to adding a splash of color to your wedding reception or rehearsal dinner! 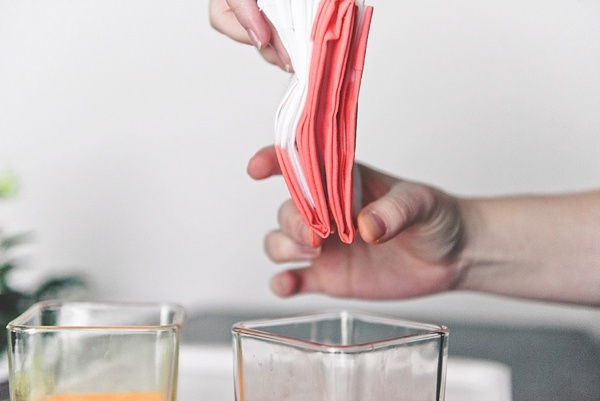 Since the beginning of this year, my husband and I have been really intentional about changing some of our lifestyle habits when it comes to being more eco-conscious about what we do and what we buy. We've switched from dryer sheets to dryer wool balls, a single user coffee maker to a traditional 12-cup coffee maker, and even single-use cotton rounds to reusable organic bamboo facial rounds. Our next step is becoming more paper-free in the kitchen. It's a work in progress, but it's also the heart behind this particular project! 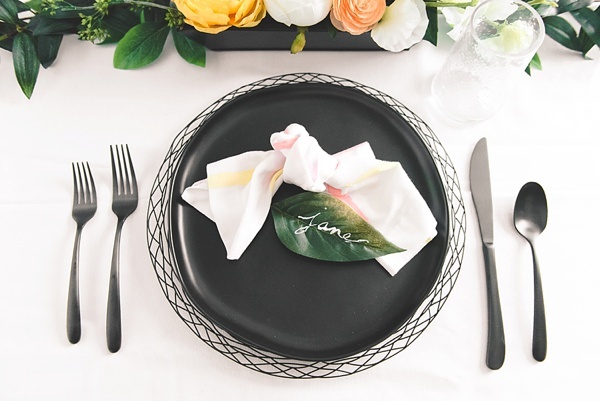 After we published a real wedding where the bride made gorgeous dip-dyed napkins for her wedding, it inspired me how perfect of a detail it is! 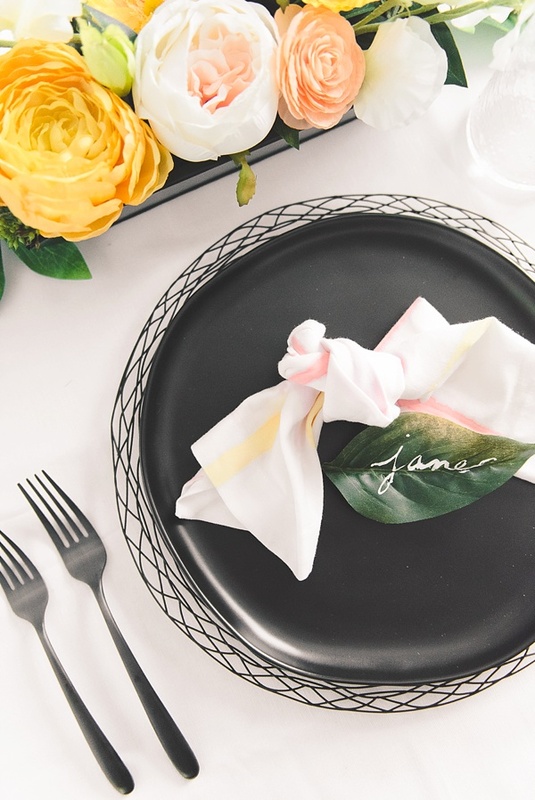 Not only great for the wedding day as a personalized touch, you can also reuse your napkins at home after the big day! Hope you love this inspiration as much I as do! 1. 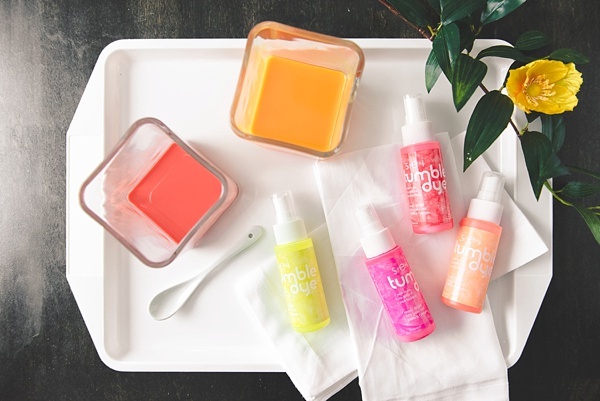 Choose your colors, shake the mini bottles, and then pour your tie dye liquids into individual separate jars. Feel free to get creative and mix up your hues! Add water to lighten your colors and other dyes to darken your colors. 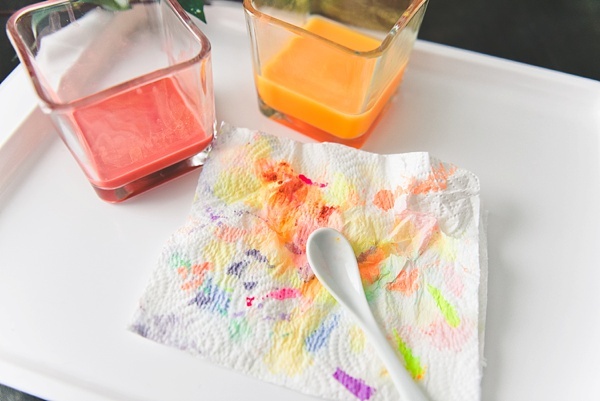 Before you decide on your official palette, test your colors on a paper towel. COLOR MIXING TIP: Tie dye is concentrated color, so use the included color guide and add a tiny bit at a time when mixing colors. 2. Fold your first napkin "long ways" in an accordion style as if you were making a paper fan in elementary school. Then fold the napkin again in an accordion style so you create a smaller rectangle. It should be about the size of a deck of playing cards. 3. Dip one edge of your napkin in the first color. Then dip the opposite edge in your second color. And repeat for each edge with however many colors you have. 4. Unfold your napkin and place on top of a plastic garbage bag to dry. 5. Once completely dried, all you have to do is heat set your tie dye with an iron or dryer! No other chemicals or special steps. This is a unique feature to this kind of dye which makes it super user-friendly! 6. Before arranging at your wedding or home, wash your napkins in cold water, air dry or tumble dry on low, and then iron them for a soft fresh look. Enjoy! Tie dyeing is such a fun experiment, especially when you have an easy dye to work with! As seen below, you can see what using 3 and 4 colors looks like. 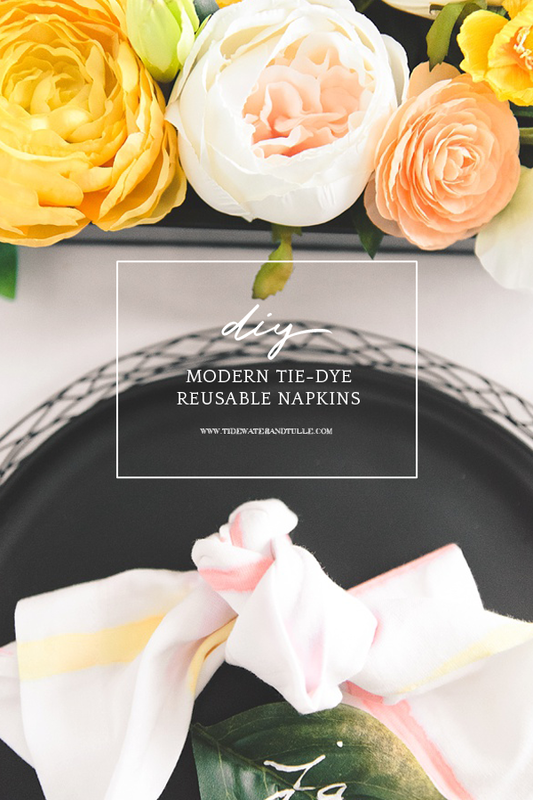 Give your folded napkin's edges a different color, dip your napkin deeper into the dye, change up the angle. Try out a few different techniques for a completely unique look! Need Some Place Setting Ideas? Editor's Note: Specially curated by us, the above product links are partner-connected and purchasing through these links means we get a small commission from those brands that helps support this website. You can find our full affiliate disclosure policy here on Tidewater and Tulle.